These look amazing, just perfect for Fortnums (sigh). Thanks for the reminder about your choc orange sticks, I remember being in complete awe of them last year (where has the time gone?) Must get organised and do some Christmas baking! Pumpkin biscotti is a lovely idea! I am prepared for Christmas to happen at all! So perfect for this event. The recipe sounds amazing!!! I yhink you neednt have worried how will you present them? I’m so looking forward to meeting everyone aren’t you? Love biscotti, and these look brilliant for the event. Im having serious headaches on what to make for it! Grat event and beautiful Biscotti…I can’t believe Christmas is almost here….time flys!! Delicious! Ohhh- I can’t wait til the event and seeing everyone’s festive creations! Can’t wait to meet you and what a GREAT way you have presented them too! It is going to be fun! wow I have never tried pumpkin biscotti..they look amazing! What a great idea. I love the packaging too. Am really gutted that I can’t join in this wonderful event but I’m sure I’ll read all about it from everyone. Have fun! What a lovely idea for the Christmas Event. 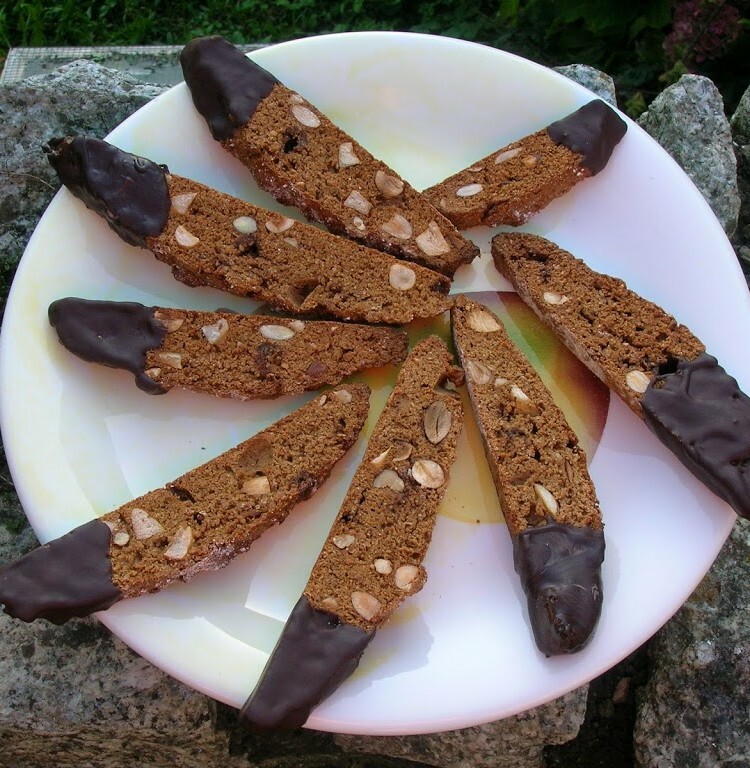 Wow – pumpkin biscotti already something else, but dipped in that chocolate just puts them on another level. Perfect for Christmas! Would never have thought of pumpkin in a biscotti. I haven’t had much luck making these, they never seem to come out quite right, too hard or too soft. They look great – I love biscotti. I haven’t even started to think what I could make this year yet…. Lucy – I bet you’ve been to Fortnum’s an awful lot more recently than me 😉 Will look out for those orange sticks on your blog. Your date fudge was on my list for this year, but I wouldn’t mind doing the oranges again – everyone loved them. FoodyCat – thank you. I usually find Christmas comes up and bites me and it’s an awful shock. Hanna – thank you. You’ll come up with something deliciously creative, you always do. Johanna – thank you. Have another batch in the oven at the moment and they are smelling amazing. Manu – thank you. I’m looking forward to the event, but finding it rather scary that Christmas isn’t so far away. Rachel – thank you. Looking forward to meeting you too. It sounds like it will be fun. Kate – pleased to hear you are coming too and looking forward to the fun. Angie – the pumpkin gives an unusual colour, which is a bit of fun. Can’t say the flavour is that noticeable though. Little Loaf – yes, quite right too. I’m getting into the mood now. Baking Addict – thank you. Shame you can’t be there, but hopefully another time. Janice – ahhh, don’t say that. I’m not sure how they are meant to be as I’ve only ever had my own!